Newly-crowned 2017 Bank of Baroda Adi Senikau, Elaine Monroe was overjoyed while taking out the top award during crowning at the Aquatic Centre in Laucala Bay, Suva on Friday night. The Adi Senikau pageant is named as one of the most popular events of the Hibiscus festival. Elaine took out the title from the nine contestants vying for the popular side show of the Vodafone Hibiscus Festival. 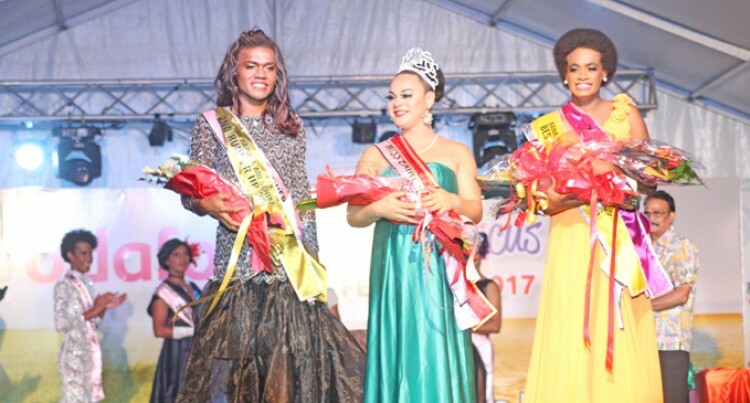 Adi Senikau Pageant chairperson Sulique Waqa said the turnout was really great on Friday night. “It was encouraging to see the support from the public and the sponsor of the event Bank of Baroda who has been sponsoring the show for the past years. “Also important was the support of the parents of the contestants who were there last night,” Ms Waqa said. The newly crowned Adi Senikau Elaine was excited about winning the crown and felt that it was worth the wait for all the times she had participated in similar pageants. The new Adi Senikau is looking forward to using this opportunity during her reign to advocate on transgender rights to live without discrimination, stigmatisation, and fear. Elaine is a young transgender woman from Savusavu who resides in Suva. The Adi Senikau contestants were presented as flight attendants representing international airlines from around the globe.